Welcome! So glad you’re here. 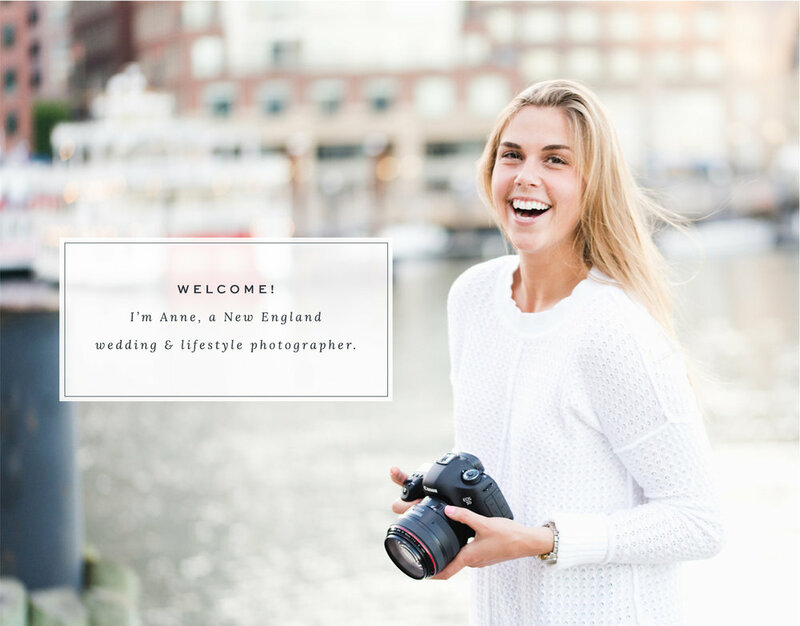 I’m Anne, a New England wedding & lifestyle photographer. For as long as I can remember I’ve been fascinated by photographs. Growing up I would spend hours looking through my grandparents’ photo albums. I would stare at each picture, memorizing each expression, in awe of how much I could take away from a simple 4×6. I loved the fact that I could learn so much about my family through these moments, captured and preserved by photography. To me, photographs have always been the ultimate gift. The fact that I am able to give this gift to my clients brings me more joy than any other job I can imagine. I’m from Massachusetts, went to school in Connecticut, spent my summers in New Hampshire, vacation every year in Maine, & spend my free weekends at my family’s home in Vermont. I LOVE New England. Although I'm based in Boston, I shoot weddings in all of these locations and I’m always more than willing to travel. During the school year, I work in Special Education at a local high school. So much of my heart is poured into this job; my students are amazing and I learn so much from them everyday. I. Love. Dogs. All dogs. If you have a dog & want to bring him/her to your shoot I have two words for you – do it. PLEASE. I love to travel. In college I spent a semester living in Florence, Italy. While I was abroad I traveled all over Europe and fell in love with every city I visited. This was where I signed up for my first photography course! I graduated from the University of Connecticut where I studied Human Development & Family Studies. This is also where I met the love of MY life, & naturally I’m a huge fan of everything Uconn and Uconn weddings. Go Huskies!